Hi! It’s Simon from Spearhead Games, here again to talk about our upcoming PS4 co-op puzzler Tiny Brains. We finished our very last updates earlier this week, and we’re finally done — it feels so weird to write that after Tiny Brains consumed my entire life for more than a year, but it’s true. 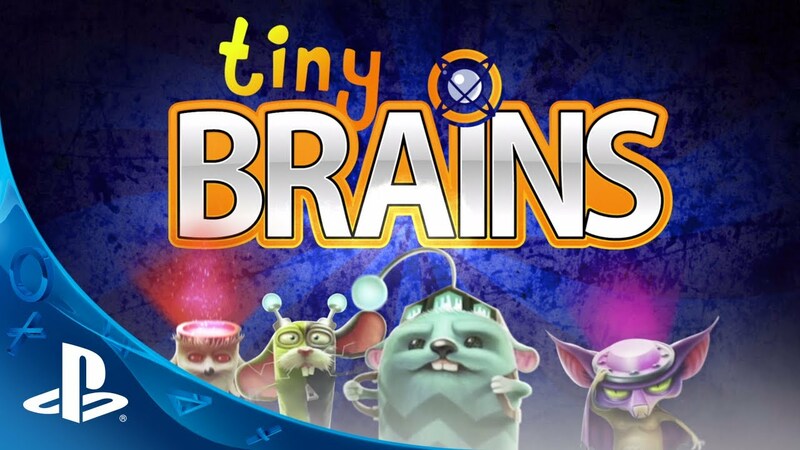 The whole team is incredibly proud to be bringing Tiny Brains to PS4 on December 3rd. Thanks to PlayStation’s support of indies, we were given the option to be featured on PlayStation Plus for the launch — it was an opportunity we couldn’t pass up! So look out for Tiny Brains soon, and in the meantime, I wanted to share our brand new launch trailer, and tell you a bit about how we’re trying to get you back in the living room for some old school co-op with a next-gen twist. When I was a kid, one of the best feelings in the world was getting a new game and rushing home to call my friends to come over and play. Crowded together in front of the screen, all excited to game late into the night; elbowing for room on the couch, gloating and swapping tips — these things are what gave me a lifelong love of video games. The launch of the PS4 marks the beginning of an exciting time for gaming, with new technology letting us play with more people, more often. It hearkens back to those “good old days” when you had new technology to show friends, and everyone wanted to come to your house to play. We’re incredibly happy that our first game, Tiny Brains, is a part of that. 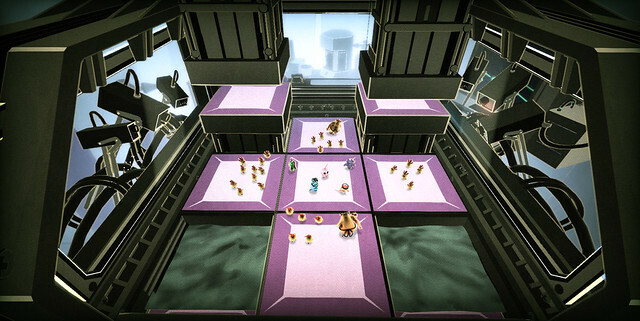 With it, I feel that we’re bridging the old and the new of multiplayer, co-operative gaming. Let me take a few steps back. I’m Simon Darveau, formerly at Ubisoft and now co-founder at Spearhead Games. Tiny Brains is a quirky, social, cooperative, action puzzler. Beyond that, it’s our baby — the game many of us left our jobs at AAA studios to make. It’s a game that’s been in our heads for a long time, all the way back from when one of my co-founders Malik and I were just kids playing games together. We both made it into the industry and eventually decided we couldn’t make the innovative types of games we wanted to make while at big companies. The process began with me sleeping on Malik’s couch (where I was nick-named his house cat), playing games together every night, and thinking about what we could do to make the ultimate social, cooperative gaming experience — something where we had to work together toward one goal rather than try to kill each other on the same screen. Fast-forward a year and a few months, and Tiny Brains has become a reality, coming out on the most cutting-edge gaming console of the new generation! 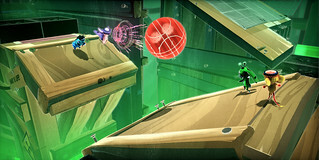 Tiny Brains is everything that the team originally wanted from a co-op game. It follows four tiny lab animals — a rabbit, a mouse, a hamster, and a bat — each of whom has been so extensively experimented on as to develop cool psychic abilities. The bat can channel his voice to force-push objects away from him; the rabbit uses an electric charge generated by his huge floppy ears to pull objects towards him. The hamster can create a solid chunk of ice out of thin air, and the mouse can swap his position with that of another object at will. Each of these powers is useful, but no one power can solve the puzzles alone. In order to progress through the mad scientist’s diabolical laboratory, all four critters must work together. This means a lot of shouting, a lot of communication, a lot of chaos, and a hell of a lot of fun. Of course, you don’t have to have three friends and four controllers to get in on the action. 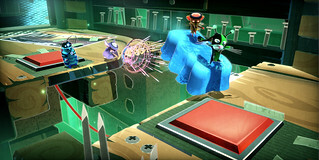 With the power of PS4, an indie like Tiny Brains can still feature online drop-in/drop-out multiplayer, and even a single-player mode in which the levels adapt to become solvable by one player. But to experience the game at its best, we highly encourage you to rally your friends, hop on the couch, and dive in together. We think you’ll like the way this old school gaming-inspired indie leverages the capabilities of the PS4. I’m stoked for the launch of Tiny Brains, and can’t wait to see if anyone can beat our developer high scores in the challenge modes. Have you been practicing your multiplayer skills? What PS4 game have you been playing the most with friends at home or online? This is a day one buy! I’m so happy to be on PSN+ right now! Your going to want those extra DS4 controllers now! But there will be special discount for PS+ members! Will there be a special discount for PS+ members? I am glad I am a PS+ member although the price is still right. I have been playing a lot of BF4 and some Resogun coop for the past week. I can’t wait to to sink my teeth into this wonderful game next week. Will there also be only coop and is there is a campaign mode? Congrats to you all and well done on being one of the very first games on the PS4! I’m confused. “We were given the option to be featured on PlayStation Plus for the launch”, that makes it sound like it will be free for PS+ members, but then you say the game will have a PS+ discount. So which is it? $19.99? Why are the PSN games so expensive? The highest priced PSN games used to be $14.99. Will wait for a 50% sale. @kivi95; they said the game will be discounted for PS+ members so since you are a Plus member you won’t have to pay the regular price. I have been in PSN since it started and games have always varied in price. I have paid any where from $1.99-$99.99 for games through the PSN. I think I heard that Jirard the Completionist got his own level in this game =D. Watched you guys play it with him I believe during Gamescon or Pax? one of those…I wish you guys all the luck with this game. I love coop games and games that break the cod mold. Really liked this at the PS4 demo stations, but found it difficult to figure things out spatially due to the TVs and generally “flat” look. Any chance this game will support 3D TVs? This looks like great fun just may pick this up!!!!!!!!! This game was amazing. Played it at PAX Seattle with four of my friends. Wasn’t planning on playing it till the lead marketing guy from 505 games at the Takedown booth had us put on Takedown shirts and play this for a company video, since we kept jumping between playing Takedown and PayDay 2. After playing this game with my four friends, and screaming at each other like 4 guys who woke up in the middle of a war zone, I can say I was hooked and can’t wait for its release on the PS4. And I was glad to get a chance to talk to the 2 developers who were at PAX who showed great passion for the soon to be customers and fans. This looks like a lot of fun. I can’t wait to get my hands on it. I’ll be buying this as soon as it’s available on PS4. Best of luck to Spearhead Games. Sounds like an awesome indie game that really thrives on the technologies and capabilities of the PS4. Games like are exactly why I bought my PS4 in the first place! I’m so glad I’m a Plus member and I can’t wait these ten agonizing days for its release. Looks like you have a winner here Simon! According to PSU, Playstation Plus subscribers will get a 10% discount. I was expecting a little bit more but I’m still gonna grab this game. Hopefully the red version of dualshock 4 will be available in Canada by then! J’espère que ça va démontrer à Pauline que des subvention au ptites entreprises peut être fructufiant aussi, J’ai hâte d’y jouer!! My cell is cellular is sony xperia ion, my tablet is Xperia Z, my sony bravia, and the PS4 is not good for my pulse wireless not working on thePs4 how many enquire you need to get a correct drive? My wife and I will definitely play this Go Co-op! A 10% discount for PSN Plus just isn’t enough for this unfortunately. Is it $20 because it’s a PS4 game? PS @ Sony: We would still like an update on you decision for mp3/DNLA support on the PS4. The Xbox One is dominating in the media center department. The PS4 is useless as a media player without important basics such as this. @SpooNManX, you have no idea about the content of this game or why it should be less than $20. It could have all the content a retail game would have, and in that case, we’d be paying $40 LESS than normal price. We should encourage variable digital pricing. I can’t wait for this game. I was really hoping to play it at launch…and then on the 26th…and now on the 3rd. Hopefully it will actually come then. Will Tiny Brains have any Vita connectivity? Yeah good question I remember back then it was announced for the Vita, is there at least remote play? I’ve finished all chapters in Jules mode…… where’s my trophy?? ?